If your idea of the perfect community for ages 55 and older includes waterfront living and plenty of ways to stay fit and spend time with neighbors, you’ll want to put Lake Griffin Harbor in Leesburg at the top of your list of places to visit in Central Florida. Our gated community of high-quality manufactured homes is perched on the edge of sun-streaked Lake Griffin, one of the largest and most beautiful bodies of water in the Harris Chain of Lakes. 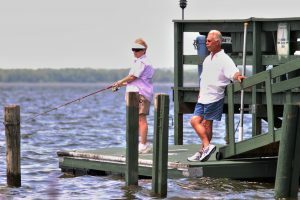 Our lake is renowned for having some of the best fishing and boating opportunities in Central FL, and we make the most of it with amenities specially designed to appeal to water lovers, including a 55-slip marina, a boat launch, a fishing pier, and fenced dry storage for boats as well. With so many opportunities to stay active at Lake Griffin Harbor, it’s unlikely you’d ever need to leave to find something to do. However, when you feel the urge to explore outside our gates, you’ll find that long stretches of acclaimed beaches, theme parks, historic sites, and some of the world’s most popular tourist attractions are an easy road trip away. Even closer are some of the nation’s top medical facilities, as well as continuing education opportunities at state colleges and universities in the area. In short, Lake Griffin Harbor represents an outstanding value in a community for ages 55 and older in one of the most scenic and convenient parts of Central Florida. For more information and to schedule a tour, contact one of our Lifestyle Consultants today.